Gifts from the Pirates: "Life in a box is better than no life at all... I expect." "Life in a box is better than no life at all... I expect." We've got a poorly little boy at home today, he was up about 6 times in the night and has a high temperature on and off so we decided to keep him off school and it looks like he'll be off tomorrow too.We have to be so careful with him being sick after having pneumonia last year. We asked him what he wanted to do today and he decided he wanted to build a robot out of boxes that he could wear (excellent choice I thought). Luckily down the road there's a packaging warehouse so off I went to get some supplies. I got home and Seth decided he was tired so he went to sleep for a while and Opeie dropped off on me on the sofa so being the nerd I am I saw it as a great chance to put The Avengers on. I didn't get to watch it all as the boys woke up and wanted the afternoon of craft to get under way. So mommy and Seth got to work on the helmet and me and Opeie started on the body. Seth loves craft, especially when he gets to go looking round the house for things to add to his creation. Me and Mrs M love getting involved too. Opeie just loves being part of the team whatever were doing he's adorable. The helmet started to look like a deep sea diving mask which was great and like most of our creations in the house that has a face, Seth wanted to put a moustache on it. We're all big fans of the moustache on our house. 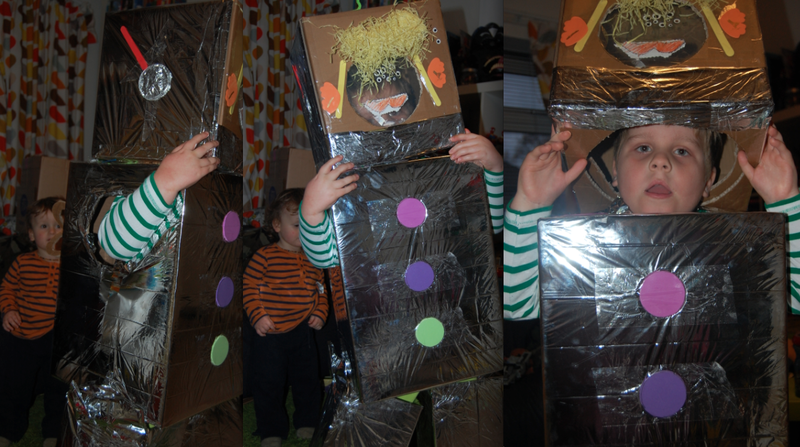 Seth then decided his robot must have sideburns and curly hair, oh and a large selection of eyes. 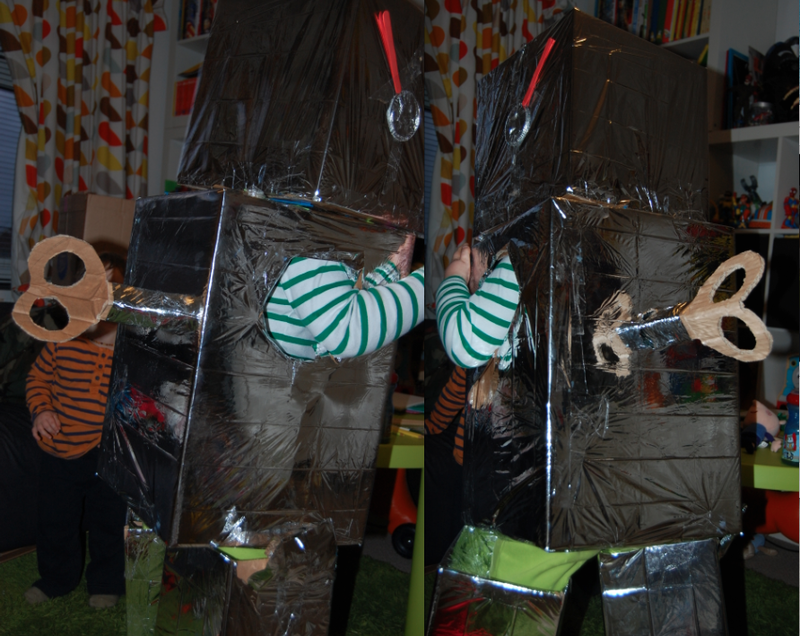 Mrs m said that it was a shame we didn't have a few rolls of tin fool in the house to cover it but then I remembered that I had a foil blanket on the cars medical bag (let's hope I don't have an accident and need to keep someone warm as Seth's robot suit lets in a breeze). 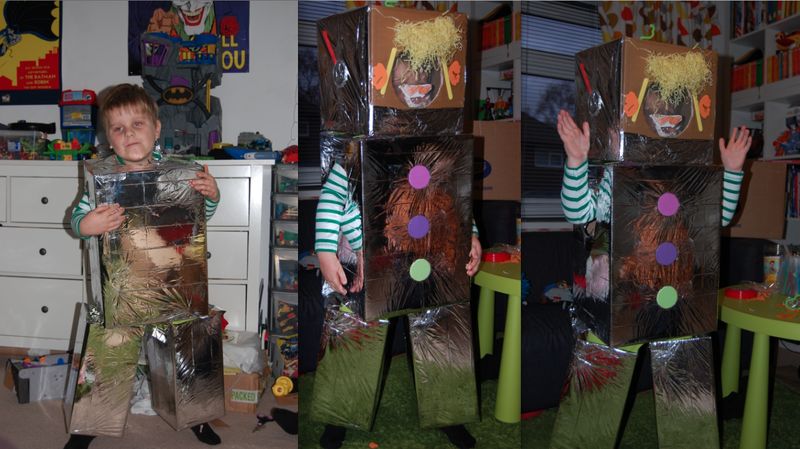 Once I'd covered all the parts on foil Seth got into decorating them while I made a key for the back. (It'll be the one time Mrs M won't mind me winding Seth up). The robot suit came out great although tomorrow we do need to make some arms maybe. We have a huge boots box in the house that Opeie has been sitting in today and Seth wants to draw a Batmobile on the side of it tomorrow so watch this space (all the toys they both have and they are still blown away by a simple box). Obviously we don't like Seth being ill but the being at home part is great and Opeie has really enjoyed having his brother at home today. Seth got really excited when he put all the parts on and started singing intergalactic by the Beastie Boys (one of his favourite songs). Well the activity certainly kept Seth mind of him feeling ill which was great so we will be filling tomorrow with fun things too.